olivetti programma 101 - delay line memory. A late 1960s desk-top electronic programmable calculator using transistorised circuitry (430 transistors and 1300 diodes), core memory and a 14 digit nixie tube display. 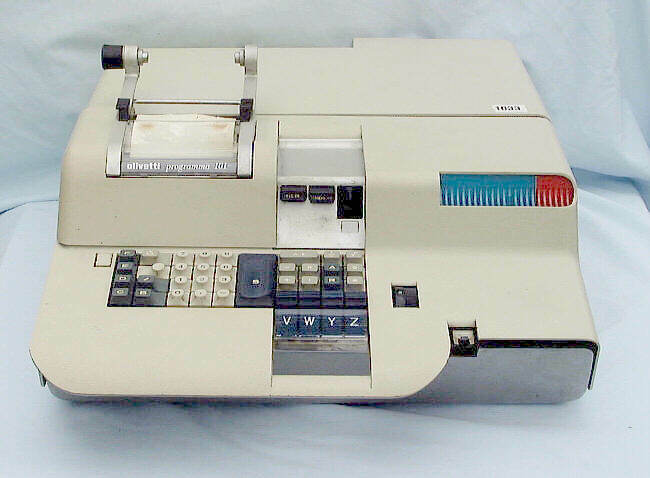 It has four user registers (I to IV), I holds up to 14 digits; II also holds up to 14 digits but also holds the quotient when performing division. Registers III & IV are limited to 7 digits, and just to catch the unwary, there is no indication if these registers become negative or overflow. multiplication or division takes 0.02-0.2 sec. 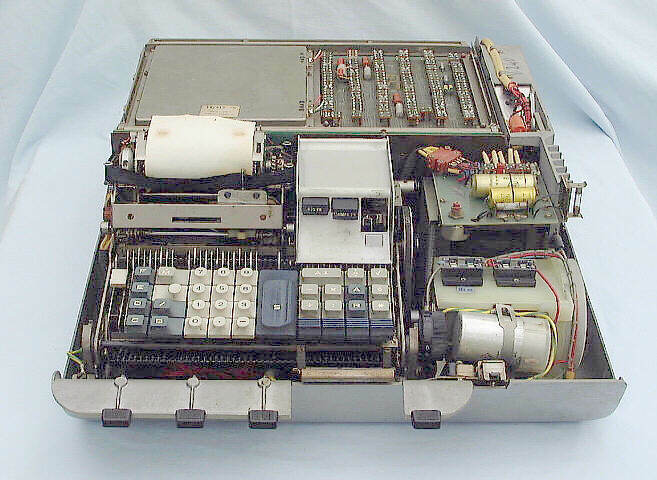 A late 1960s desk-top electronic printing calculator using transistorised circuitry and core memory. 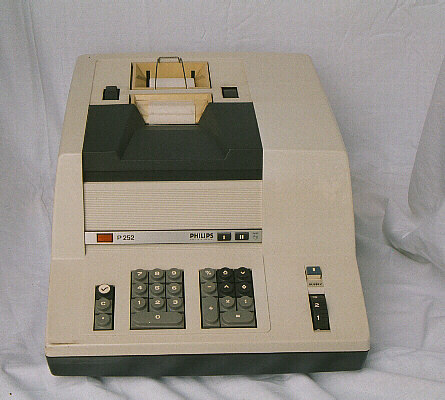 It has three 14 digit operating registers and two additional registers available to the user. The machine has an early type of dot-matrix print head. ANITA is an acronym for A New Introduction To Arithmetic. 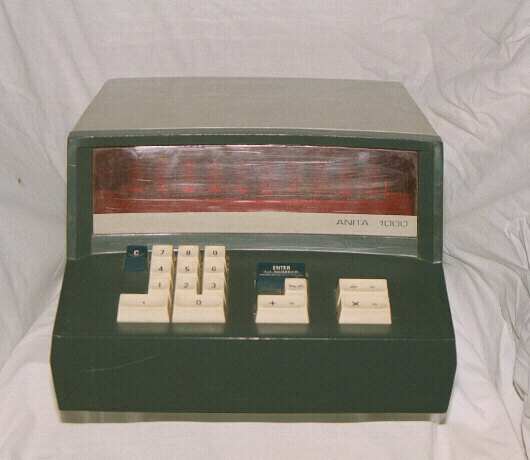 In 1961 Sumlock Comptometer Ltd. and Bell Punch Ltd., joined forces to produce the first commercial all electronic desktop calculator, the Anita Mk VIII. The manufacturing company becoming known as Sumlock Anita. 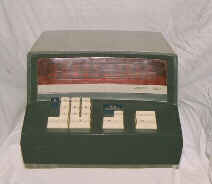 One of their later products was the model 1000, which was introduced in 1969. 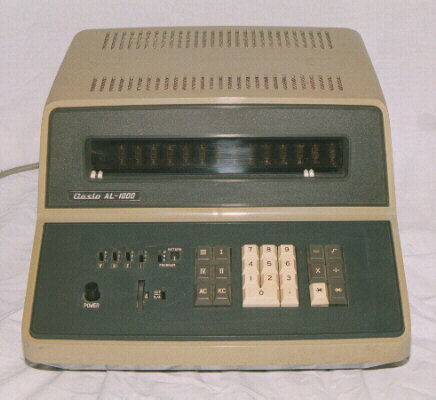 This machine is a four function, reverse polish logic calculator with a ten nixie tube display. The model 1000 does contain some integrated circuits but is largely a transistor based machine. A magnetic card programmable calculator with a very elegant design of casing. It is also a very late example of the use of delay line memory. (See below). This is a very late example of delay line memory technology. Originally, delay line memory used five foot long mercury-filled steel tubes and a store of any size might contain several hundred pounds weight of mercury. 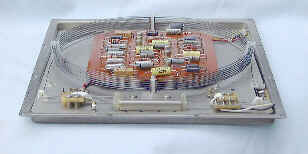 The final refinement of the delay line was the nickel delay line, where the pulses of sound were recirculated within a coil of nickel wire.